We’ve always felt that positive emotions are contagious with leaders potentially having profound impact on followers. Now through the work of the authors and other neuroscience researchers, hard evidence is being produced that allows the development of a better understanding of how the brain functions during interpersonal exchanges. We can now use this new knowledge to become more effective leaders and managers. The authors also discuss the recent discovery in behavioral neuroscience of mirror neurons and their particular importance in emotional contagion and leadership. They validate the importance of young aspiring leaders in identifying mentors to assist them in their leadership journey. Spending time with a living, breathing model of effective behavior provides the perfect stimulation for our mirror neurons, which allow us to directly experience, internalize, and ultimately emulate what we observe. As usual with Goleman and Boyatzis, there’s lots of great information, so we recommend you buy the article if you’re not all ready a Harvard Business Review subscriber. Here’s a link to a special offer to subscribe. There’s an HBR video interview with Goleman that’s worth watching here. 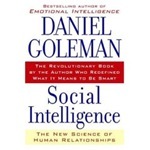 Tagged with emotional intelligence, Harvard Business Review, social intelligence.